I know lately I’ve been talking a lot about food on the go, but I don’t think I’m the only one with a busy schedule, trying to get nutrients into the kids and myself and avoiding drive thrus! Can I hear an “Amen”? 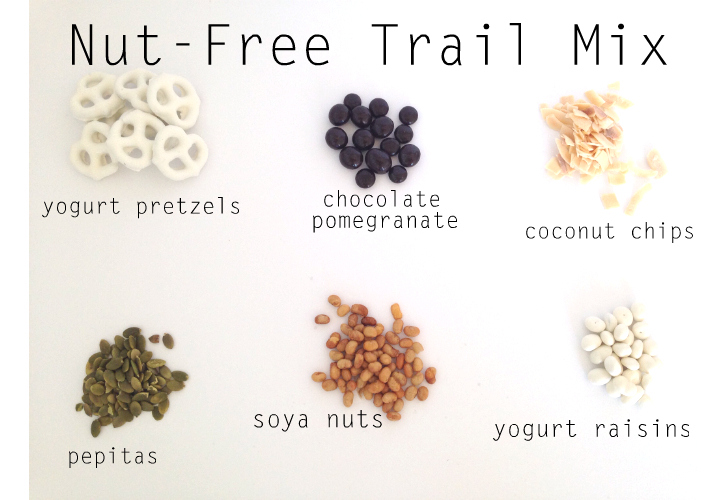 I love a good trail mix, but I find that pretty much all of the pre-made ones contain nuts. I LOVE nuts…really ANY kind of nuts, but the kids can’t take nuts to schools or their after school activities because of kids with allergies. So, I’ve come up with my own mix that’s nut free*, full of protein and quite healthy! I’m loving the line of snacks at Walmart called Joe’s Tasty Travels….they have a stand alone rack usually close to the produce department. Joe’s Tasty Travels has each of these items prepackaged except of course, the chocolate promegrate, but Brookside products are available at Walmart as well. Superstore also has many of these items available prepackaged. Or, you can get most of these things in the bulk food section of your grocery store. 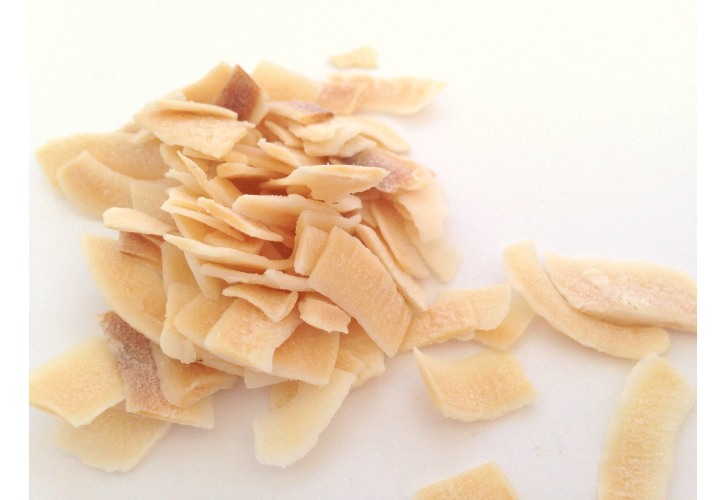 Toasted coconut chips..you won’t believe how yummy these are! 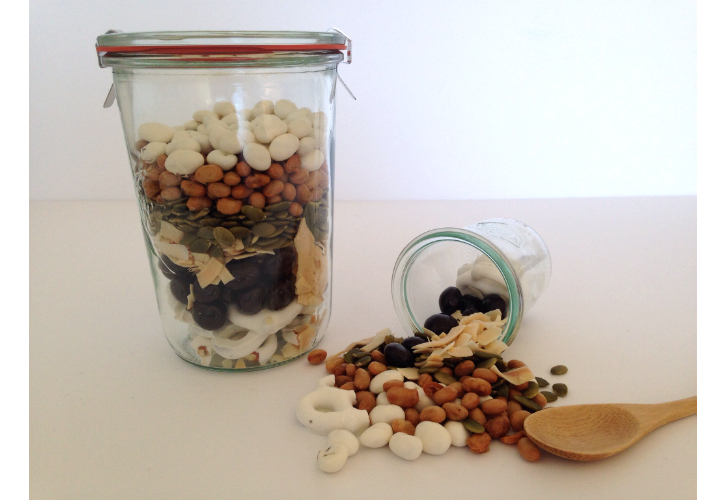 The pumpkin seeds and the soya nuts add a ton of protein to this mix. And, let me talk a bit about the toasted sliced coconut. Ok, this is my new obsession…..it’s perfectly sweet and salty and adds an amazing crunch. I could seriously eat a whole bag of this gold! If you can’t find Joe’s Tasty Travels Toasted Sliced Coconut, both Hippie Snacks Coconut Chips and Trader Joe’s Roasted Coconut Chips are amazing!! Be prepared to get addicted! It’s quick and easy to mix up a batch of this and scoop it out into snack size Ziplocs. 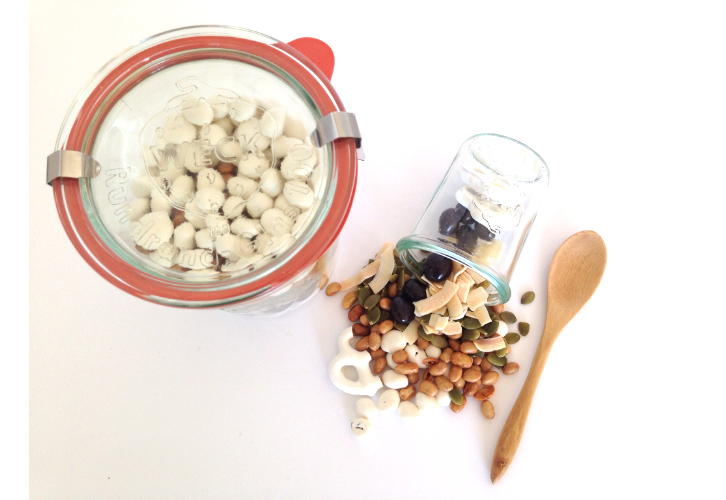 It’s a great source of energy and protein without the worry of nut allergies! !